In 1977 I read Dervla Murphys book Full Tilt: Ireland to India on a bicycle. I put the book down and read it again immediately. I was gobsmacked. She cycled across Europe in winter continued across the Turkish mountains,across Afghanistan,Pakistan and into India on terrible roads and with a 3 speed bicycle. So I started planning my own trip to India. I bought a 5 speed Raleigh Corsa bicycle and told everyone in work what my plans were..I got in so deep there was no way out! Then someone asked me what I was going to do when I got to India! Cycle back Tony? It occured to me in a flash..No of course not...I'm going to just keep going. In August '78 I set out to cycle around the world. I couldn't even fix a puncture. My heavily laden bicycle got about 8 in the 160km to Rosslare Harbor. I had to cycle late into the night to catch the ferry to France.I ditched some of my baggage and cycled myself fit. I returned 15 months later severely bitten by the travel bug. For the next 15 years I continued taking extended vacations often on my bicycle in (at that time) exotic locations such as Iceland, Cuba, Czechoslovakia, Hungary, Poland, Liechtenstein, Andorra and Egypt, as well as hitch-hiking around the middle-east and taking a year out in 1983 to cycle and hitch in South America. Other than kicking a football around Dublin's streets I don't think I would consider myself from a sporting background. It just kinda grew on me.I used to run to football training and then run home later to improve my stamina.The penny dropped when I got a very bad ankle injury and missed running more than football.That was almost 25 years ago and I haven't kicked a competitive ball since. I was going out with a girl whose boss was on my now running club's committee.She suggested I join MSB A.C. I ran the marathon within 5 weeks of first serious lacing of my running shoes.I I did my one and only long run of 35km just 7 days before. In the marathon I ran 3.09 and was hooked. Gradually I got my time down to 2.38. In 1994 I obtained a green card and emigrated to Colorado,USA. There I discovered the wonders of mountain ultra running.I more or less drifted away from the cycling at this stage..Gradually I progressed to running 24 hour races...I was obsessed by 24's and in an attempt to try to make them 'shorter in my mind' I entered a few 48 hour races only to find I was more competitive with these! In 2002 I returned to Ireland after getting a bad foot injury. Around this time world record attempts were very popular on treadmills. 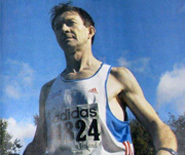 I had a couple of shots and in 2003 managed to get both the 24 and 48 hour world records at the Dublin marathon expo. I was working in construction as a snagger and used to run in and out of work.Everyone used to sneer and say I musn't be working hard if I still had the energy to run home after a long hard day on my feet. I used to say that it was my running training that made me fitter to work hard and when I stepped in the door I was well warmed up! I always found construction work to be an excellent way to maintain exceptional fitness,especially when I was injured and couldn't train,I rarely lost any. I don't think the dust helped me much though. I used to run everywhere.I had a small blue satchel and if I needed a magazine in the city or needed to post a letter I usually just ran. I made a few appearances for Ireland for 100km and 24 hours and seemed to be able to run a very consistently reliable 24 hour distance. In March 2007 I booked a Ryanair flight to Brno,Czech Rep. for a 48 hour indoor race.I really had no expectations as I was just going for the experience. 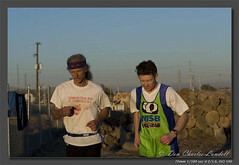 I was wearing my race shoes on the plane and was traveling with just a small amount of carry on baggage.I didn't even bother bringing much race food..During that race I ate the candy I had bought for my niece and nephews..It seemed to hit the spot...I ran like a man possessed and often wonder if I received some form of divine intervention as I broke the world indoor 48 hour record with 426.178km running for 47 of the hours and walked just 750 meters. This was also the first occasion that a runner ran 2 consecutive days of 200km plus.. Three years later a committee of ultra running researchers and ultra running historians awarded me with a world first for 48 hour running. My splits were 223 and 203km...I was staggered and shocked by this race of my life. 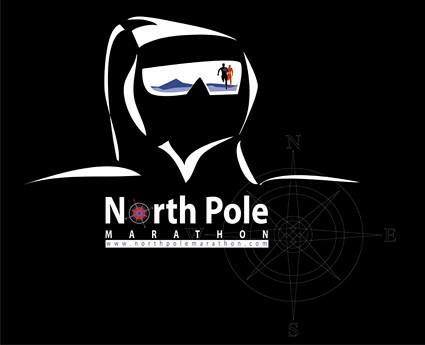 Due to this performance I received an invitation to run the prestigious invite only Surgeres 48 hour race in France. Before accepting I thought long and hard about competing as clearly 8 weeks would not be enough time to recover from a world record performance in Brno. I went against the advice I was given and in Surgeres I surprised myself again by running 401km to finish second. Those 8 weeks were the greatest weeks of my running life. I have never reached those lofty heights since,save for a 405km to regain my world 48 hour treadmill record in Longford Ireland. Getting that record back was so important to me..I was injured having not run much in the previous two months. it was pure determination running through the pain and fatigue barriers that won me that record back.You see the man who took it off me skirted the rules and was holding the treadmill bars as he was running...Yes amazingly its not against the rules to run on a treadmill while holding the bars! Just try it in your gym...If you hold hard enough you can even almost fly above the belt..is this running?? No athlete worth his salt would 'run' in this chicken fashion!He actually has records for coach surfing watching mind-boggling daytime tv watching Judge Judy and Seinfeld for weeks on end and thinks running on a treadmill should allow him to hang onto the rails like he was holding onto a zimmer frame for dear life! I now look forward to a new career as a journey runner.